Yesterday was RANDOM. But that english word isn’t really sufficient to describe it, hence the title of this post : sin rumba. Un día al azar woulda worked too. In the morning, Tania, Sarah, and I took the subte to class as usual. 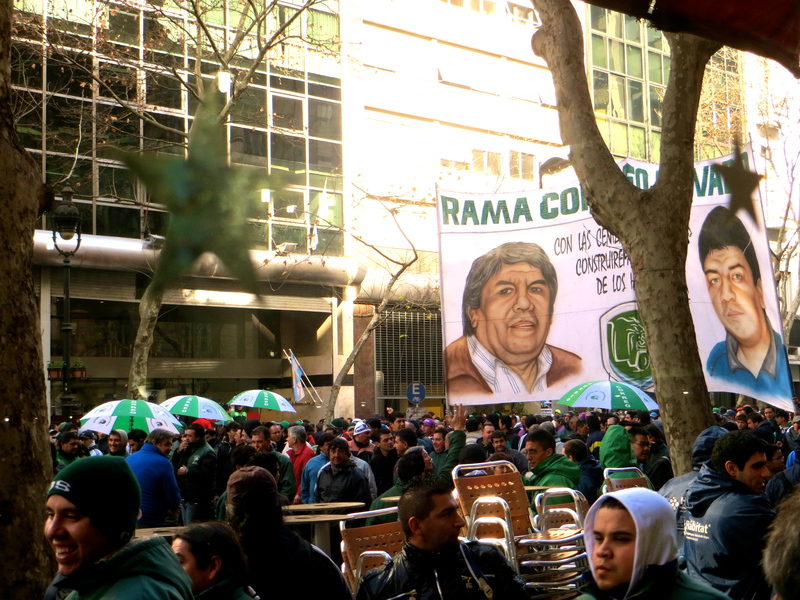 When we got off in Plaza de Mayo, we heard live music, smelled asado barbequeing, and saw the streets completely void of cars (when usually, they’re driving in hot pursuit of pedestrians). The three of us went into the Plaza, saw a few crowds, checked out the asado stands, then went to our “usual” cafe up the street for a café con leche y some medialunas before class. Then, SUDDENLY we here what I thought was a gunshot and thousands of people (literally 20,000) came marching past the café window. 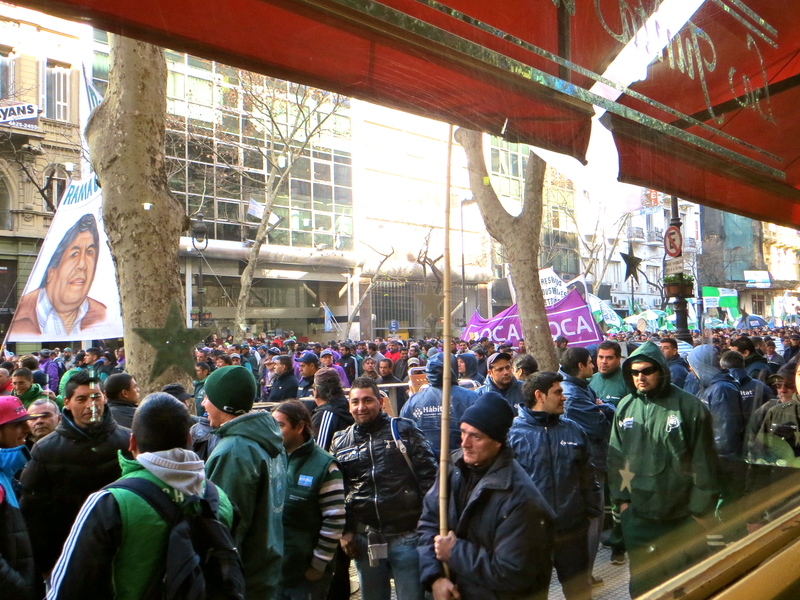 Turns out it was a truck driver protest against new taxes. The café owners locked the front door, and we had to find the moso in order to leave. 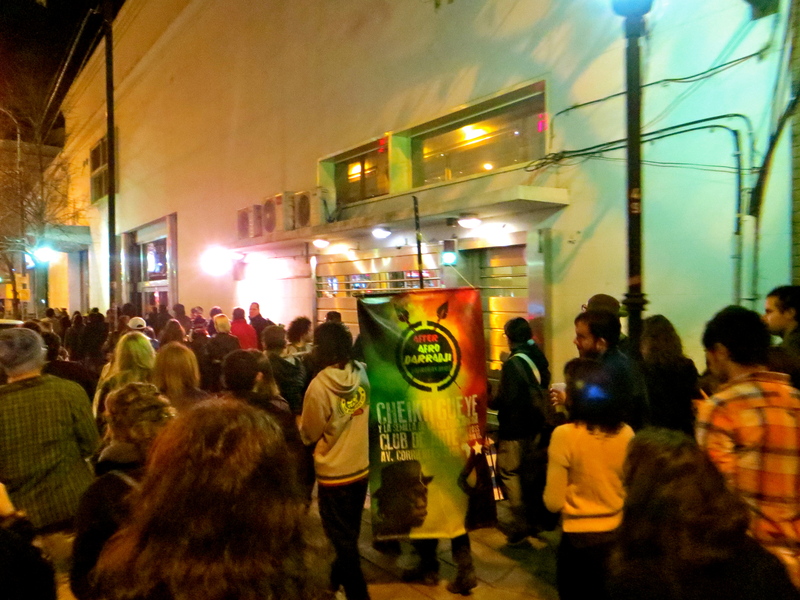 That night, we went to La Bomba de Tiempo, a weekly improv drumfest in the Abasto neighborhood. 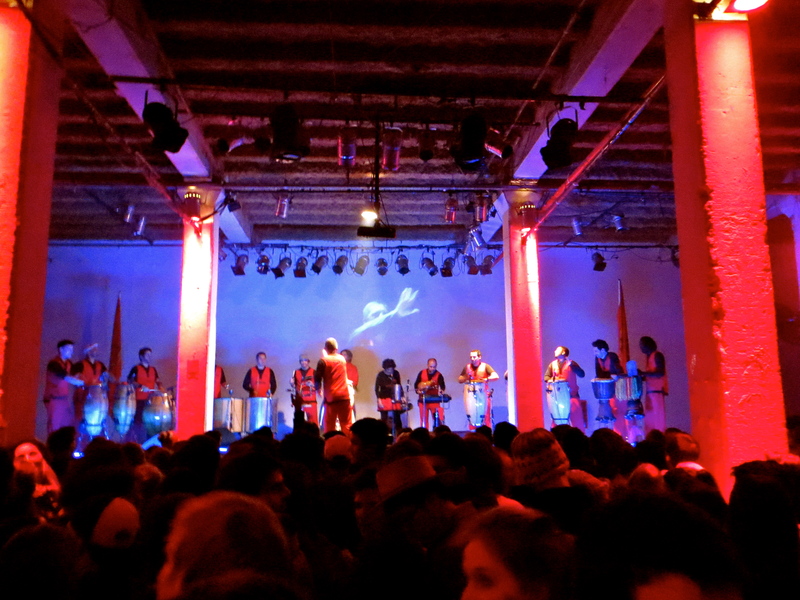 The 17-piece drum group plays at this cultural center called Konex, which is actually a converted cooking-oil factory. But the sin rumba part came after the concert. 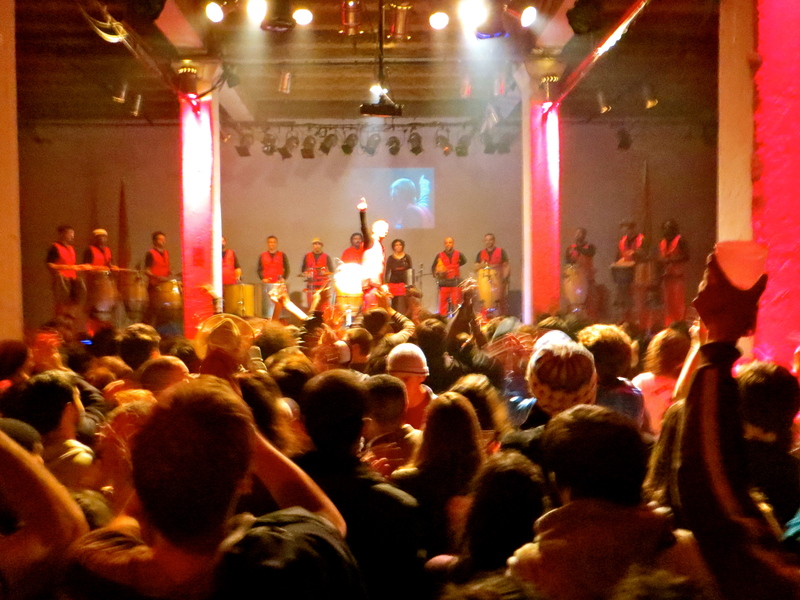 A woman I met, who goes every Monday to see La Bomba, told me there would be an after-party 2 blocks away. She said it would be easy/obvious to find because there would be a group traveling there. What we didn’t expect was for a group of percussionist to actually lead the group to the after party. 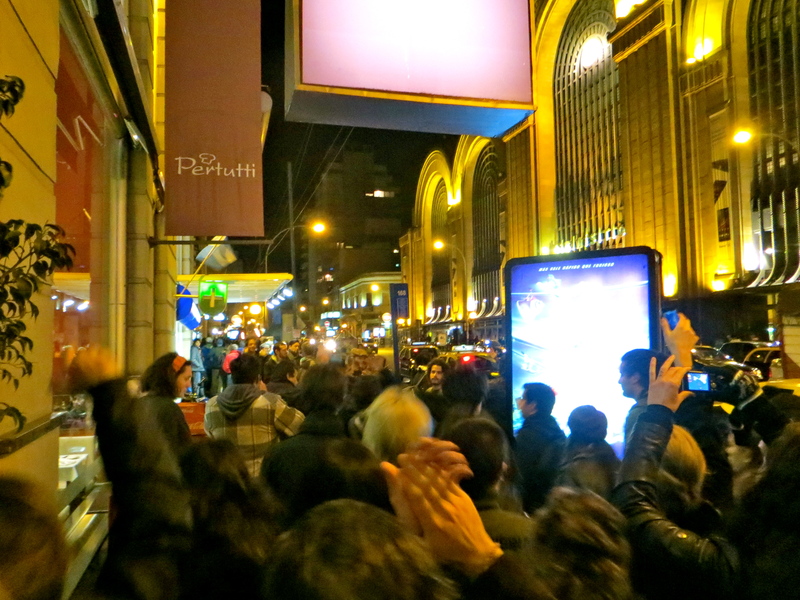 For almost 10 blocks, we were part of a crowd of audience-members travelling through the streets, following these dancing, singing, drum-banging musicians. The entire crowd was jumping up and down, singing and dancing to the beat. More than a few taxi drivers yelled at us for blocking traffic. Then, I don’t know who the heck knew where to go, but suddenly each party-goer was squeezing their way through this tinyyyyyyyyyy steel door sandwiched between two shops. I walked past a large, official-looking man on my way inside, then proceeded up a narrow staircase. Once I got to the top, the entire room opened up to reveal a cumbia salsa club. There were two different rooms for dancing, a bar squished between the two rooms, and a stage overlooking one of the rooms. I found the woman I had met earlier, and many other Argentinians. I had one really good salsa partner (and I was really surprised I remembered my salsa moves from lessons my grandma made me take back in the day). Oh ya, and then I left with Sarah and Jose, and we didn’t have enough $$$ for a cab, so we walked like two miles home. Every person we asked for directions laughed, but eventually we found a bus so that was nice. So yes, in summary, yesterday was a day sin rumba.